This watch company began in 1833, as a small shop. Antoine LeCoultre’s dream was to produce quality products and this company has achieved this goal. Credited with developing precise precession and mechanism, LeCoultre revolutionized watches of the period by push-button lever system. No longer were watches required to have a key to wind their mechanism. He also created the world’s most accurate measuring system, the millionometer, which measured to the nearest thousandth of a millimeter. In 1866, Elie LeCoultre carried on his father’s dream by producing 350 timepiece calibers and movement blanks for Patek Philippe of Geneva. However, it was not until grandson, Jacques-David LeCoultre took over as company head that the watchmaker finally began producing high-end watches of its own. 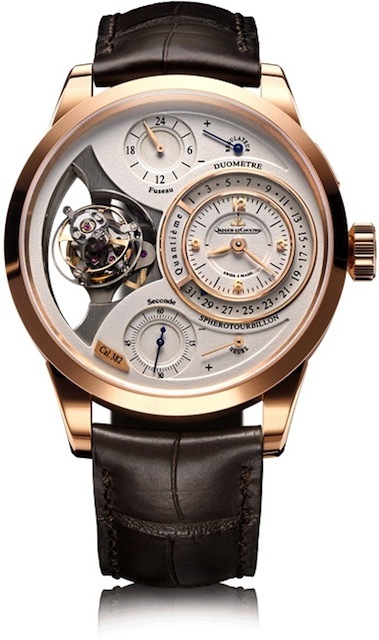 But, this was not before LeCoultre teamed up with Parisian Edmond Jaeger. Their goal was to make ultra-thin designs. By 1907, a 15 –year contract was signed to produce movements designs solely for the French jeweler, Cartier. And in 2937, the LeCoultre name officially became Jaeger-LeCoultre. This reflected a long partnership and also very successful business decision. Today, the watchmaker has built on its reputation for class and style by paying homage to the past. Recently the Swiss maker acknowledged their classy, retro-design of Batman’s new timekeeper in newest Batman flick that mimics the classic 1930’s Reverso watch. This two-faced watch is an iconic favorite and 80 years after its initial release, still considered a must-have for serious watch wears. Those who adore cartoon heroes, and want to pay tribute to a number of leading men, who have donned the Bat mask, will appreciate the black silhouette of Bruce Wayne or Gotham’s Batman. Is there a better way to remember the past and celebrate? Part of what also makes this watchmaker stylish is thinking-outside-the-box. It wasn’t just enough to recreate a classic watch. The company also paid homage by developing a virtual museum of its webpages, dedicated to Reverso. Several celebrities assisted with the tribute, including Clive Owen, the virtual host of this excursion. Other celebs representing this top brand are: Lia Salvo and Diane Kruger and whom are showcased in the “Seen on The Wrist” presentation of the watchmaker’s virtual museum. One thing that Jaeger-LeCoultre also guarantees is an international guarantee, except for the United States and Canada. These two countries do have a limited warranty serviced through Australia. All service work must take place on-site at an authorized Jaeger-LeCoultre repair center or authorized Jaeger-LeCoultre service center. Being respected isn’t just for price, but workmanship. It isn’t just this watchmaker’s eye for quality, but also the thoughtfulness behind all the watch component and design itself. All Jaeger-LeCoultre pieces are produced in-house. And, many are impressive. When is the last time you saw a watch with a mechanical automatic movement, such as the watchmaker’s Geographic Automatic Steel, which features a 43-hour power reserve. Crafted with stainless steel, rose gold, 18K gold and Titanium, do not let the simplicity of these watches fool the eye. Though some models may not feature as many jewels as their counterparts, this watchmaker’s surprise is in their undeniable and remarkable quality. Even the graceful, Art-Deco style of the beautifully crafted Rendez-Vous collection is a visual reminder of this watchmaker’s attention to detail. With its Mother of Pearl dial and face adorned with diamond-gem settings, any lady can appreciate this delicate-looking piece. Though LeCoultre changed its name to Jaeger-LeCoultre, the company has marketed its watches to American buyers under the name, “LeCoultre.” This has mistakenly confused plenty of official company authorized repair dealers who mistakenly have turned customers away in the past. The repair personnel were not aware LeCoultre and Jaeger-LeCoultre are indeed the same company. Up until 1985, the watchmaker’s products when shipped, simply said, “LeCoultre”. The possible confusion may have stemmed from the fact a 1950s North American distributor of the Swiss maker’s wares also distributed another famous watchmaking companies products. Customers simply confused the channel distributor, mistaking him for the manufacturer. After 1985, ‘LeCoultre’ simply became Jaeger-LeCoultre and helped ease further confusion over the name-change. Thinking of buying a new valuable watch? For watch owners only, the company has a website dedicated solely to Jaeger-LeCoultre watch owners. Not all watch makers have an Internet presence or will take the time to join discussions with their fans and members. For exclusive owners, the moderated website allows fans to get care instructions for their treasured timepieces, hear other users’ stories, and get online assistance with their needs.